This shot is a combination shot using Narrow Band filters to bring out the nebula itself with RGB data to bring colour to the stars. NGC 281 is an Ha region about 10,000 light-years away in the constellation of Cassiopeia and part of the Perseus Spiral Arm. It includes the open cluster IC 1590, the multiple star HD 5005, and several Bok globules. 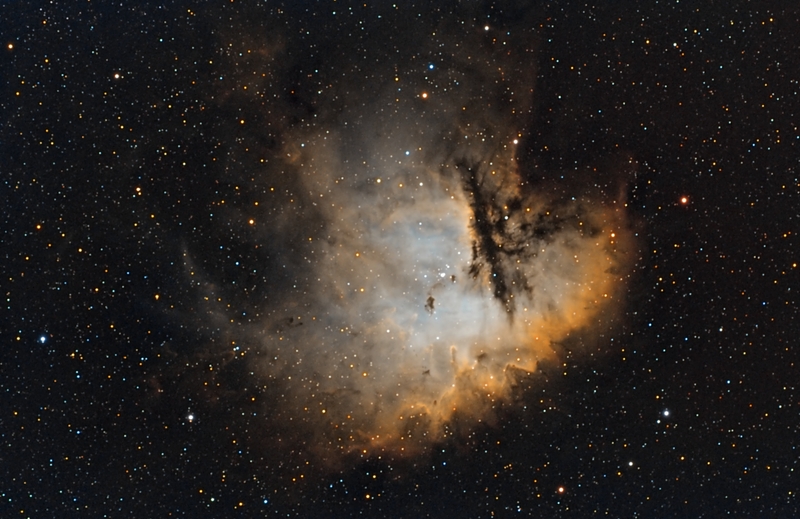 Colloquially, NGC 281 is also known as the Pacman Nebula for its resemblance to the video game character. The nebula was discovered in August 1883 by E. E. Barnard, who described it as "a large faint nebula, very diffuse." The nebula is visible in amateur telescopes from dark sky locations. Filters: Astrodon Ha 3nm, Astrodon SII 3nm, Astrodon OIII 3nm, Astronomik RGB 2"